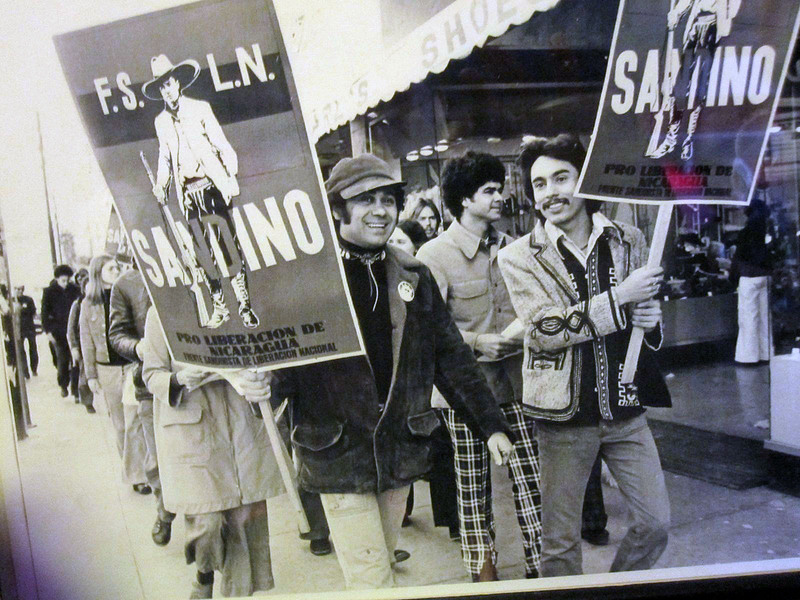 A 1980s protest in the Mission District. Poet Roberto Vargas is on the left, Francisco Flores, center, and the author Alejandro Murgia is on the right. 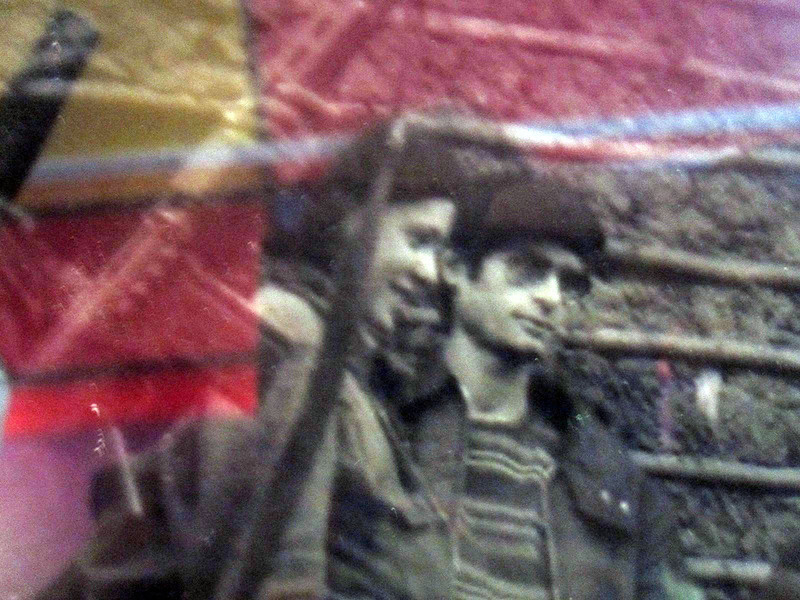 It was a humanitarian response to a 1972 earthquake that inadvertently led to a Mission-based solidarity movement that impacted revolutions in Central America, turned the 24th and 16th Street BART stations into gathering points for demonstrators and sent some Mission men to the battlefront. “They named 24th Street after Sandino, the Nicaraguan hero,” said artist Romeo Osorio, who owns the Pinata Studio Gallery on Mission Street. The writers and artists who participated in that movement will reunite tonight at the Mission Cultural Center to celebrate their work and Vargas’s 70th birthday. It was Vargas who led the Mission’s response to the quake that destroyed Managua, the capital of Nicaragua. With help from other Nicaraguans living in the Mission, Vargas, then a San Francisco Neighborhood Arts Program organizer, set up donation centers in the Mission. “We’d be unloading trucks at midnight, because we all had day jobs,” said Vargas, who was born in Managua and raised in the Mission. Eventually, word got back to the volunteers that the money they raised and the goods they donated never reached the earthquake victims. “Their dictator was keeping it,” said Vargas. That dictator, Anastasio Somoza Debayle, was part of a family that had ruled Nicaragua since 1936. “Ten thousand people died in that earthquake,” said Vargas. “And this guy, all he tried to do was enrich himself over that tragedy. That realization began a solidarity movement that would use art, political influence and for some, their bare hands, to fight against oppression in Central America. The movement started with Nicaragua and expanded to support revolutions in El Salvador, Chile and Guatemala. Vargas formed the Nicaraguense Comité Cívico, or the Nicaraguan Civic Committee, around 1974. “We started working together to help liberate Nicaragua,” he said. Some of the members would eventually leave the U.S. to fight in the civil wars in Nicaragua and El Salvador. Roberto Vargas and a group of poets, writers and intellectuals started the solidarity movement from the Mission. In the Mission, there was power in numbers. A thousand exiles from Nicaragua were already settled here, according to Vargas. They lived among others who fled crises in Central America. San Francisco’s liberal political climate was a draw. 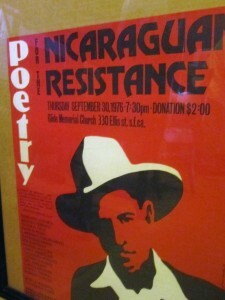 In a back room of his gallery, Osorio has many of the solidarity movement’s posters. Even more solidarity art, he said, is kept at the Mission Cultural Center, which was the movement’s primary venue. Some of the writers and artists were happy to remain in the Mission and use their work to spread information about the poverty and oppression in Central America. But a small group of the activists decided — like other American artists and writers had during the Spanish Civil War — that they would fight in the wars. Vargas, Osorio and Murguía decided to fight. But first they had to train in San Francisco. In 1980, Osorio returned to El Salvador to fight in that country’s 12-year civil war, which ended in 1992 with the signing of the peace accords and the assimilation of the rebel forces into the political process. For all the men, their best memories of the solidarity movement took place while organizing from the Mission. From 1978 to 1979, before the war ended, Vargas’s committee would organize marches from 16th Street to the 24th Street plaza. A Night to Celebrate San Francisco’s Nicaraguan Solidarity Movement starts at 6:45 p.m. tonight at the Mission Cultural Center.